Istanbul Journal of Pharmacy is published regularly and continuously three times a year. It is an open access, peer-reviewed journal for the publication of original articles, short reports, letters to the editor and reviews in English on all aspects of the pharmaceutical sciences. Ever since the Journal of Faculty of Pharmacy Istanbul University published its first volume as İstanbul Üniversitesi Eczacılık Fakültesi Mecmuası in 1965, the journal aimed firstly a reflection the scientific performance of the Faculty of Pharmacy, İstanbul University. It is the first Pharmacy Faculty Journal in Turkey. A half a century landmark for a small scholarly journal is certainly an event to be honored. Its founding editorial board, under the leadership Prof. Dr. Hayriye Amal, was Prof. Dr. Rasim Tulus and Prof. Dr. Asuman Baytop (1965-1978). Subsequently, it has been edited by very precious members of our faculty: 1979-1981, Prof. Dr. Rasim Tulus, Prof. Dr. Asuman Baytop and Prof. Dr. Nedime Ergenç; 1982-1986, Prof. Dr. Asuman Baytop and Prof. Dr. Nedime Ergenç; 1987-1992, Prof. Dr. Asuman Baytop, Prof. Dr. Nedime Ergenç and Prof. Dr. Nadir Büyüktimkin; 1993-1998, Prof. Dr. Ayhan Ulubelen, Prof. Dr. Nedime Ergenç, Prof. Dr. Günsel Alpmen, Prof. Dr. Neriman Özhatay and Prof. Dr. Ahmet C. Ekinci; 1999, Prof. Dr. Günsel Alpmen, Prof. Dr. Sevil Öksüz, Prof. Dr. Neriman Özhatay, Prof. Dr. Ahmet C. Ekinci and Prof. Dr. Zafer Cesur; 2000-2002, Prof. Dr. Neriman Özhatay, Prof. Dr. Sevil Öksüz and Prof. Dr. Hakan Berkkan; 2003-2004, Prof. Dr. Neriman Özhatay, Prof. Dr. Sevil Öksüz, Prof. Dr. Hakan Berkkan, Prof. Dr. Ali H. Meriçli and Prof. Dr. Gültaze Çapan; 2005-2006, Prof. Dr. Neriman Özhatay, Prof. Dr. Sumru Özkırımlı, Prof. Dr. Hakan Berkkan, Prof. Dr. Ali H. Meriçli and Prof. Dr. Gültaze Çapan; 2007-2010-2011, Prof. Dr. Neriman Özhatay, Prof. Dr. Ali H. Meriçli, Prof. Dr. Gültaze Çapan and Prof. Dr. Yıldız Özsoy Erginer; 2012-2013, Prof. Dr. Neriman Özhatay, Prof. Dr. Ahmet O. Araman, Prof. Dr. Buket Alpertunga, Prof. Dr. Nilgün Karalı and Prof. Dr. Yıldız Özsoy; 2014-2016, Prof. Dr. Emine Akalın, Prof. Dr. Ahmet O. Araman, Prof. Dr. Buket Alpertunga, Prof. Dr. Nilgün Karalı and Prof. Dr. Yıldız Özsoy. By 2017, the name of the journal has changed as Istanbul Journal of Pharmacy and also publication period has changed as triannual. 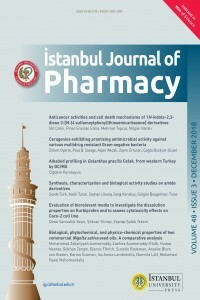 Istanbul Journal of Pharmacy covers the research on all aspects of pharmacy presented as original articles, short reports and reviews.